M3Sat Italy: Teleports in Roma and Milano. From two teleport facilities in Milano and Rome, M-Three offers a wide range of top level broadcast and connectivity services. Thanks to the Interoute® fibre networks, M-Three extends to worldwide operators and broadcasters the availability of its solutions. No matter where you create and generate your contents, M-Three provides turnkey solutions to connect your studio or local POP to teleport facilities, and hosts single devices to full transmission systems. Network integration with partner platforms adds coverage and increase the service level. 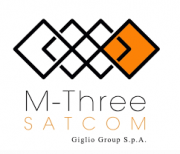 M-Three teleport locations in Milano, Rome and Bari give access and visibility to a wide variety of satellites and represent a perfect gateway for international customers.